(07-26-2018 04:27 PM)BlazinBham Wrote: What the heck are we doing? Oh I shouldn’t blame UAB? An athletic department that hasnt given a about basketball since Anderson left? Say what we want about the trustees and football, but basketball is on us. Murray State, FGCU, Georgia State, Little Rock, MTSU have done just fine with working around the same circumstances in regards to making the tournament. So we should just keep doing the same things hoping for better results? Excellent. Same day as Camillia bowl again. Also I would have expected at least one buy game for UAB. I would too. Swap out the game with UNA or Arkansas Monticello and hit the road. Get some experience for the young guys against a good team while picking up some extra cash. Although this is just the home schedule so hopefully there's a meaningful road game in the schedule other than the Advocare tournament. That's pretty much the whole schedule. Numbers-wise there is room for only one more (road?) game. (07-27-2018 09:50 AM)blazerjay Wrote: That's pretty much the whole schedule. Numbers-wise there is room for only one more (road?) game. Wonder what direction they're thinking. If they go with a buy game then this looks like a pretty good schedule. Great Thanksgiving tournament, basically home vs. Auburn, home vs. Mercer, at Memphis, at hopefully a school with name recognition. Added in last year's KenPom ratings for the OOC opponets. (07-26-2018 03:27 PM)ATTALLABLAZE Wrote: Honestly I'm ready to get Troy off the schedule as much as Alcorn State. 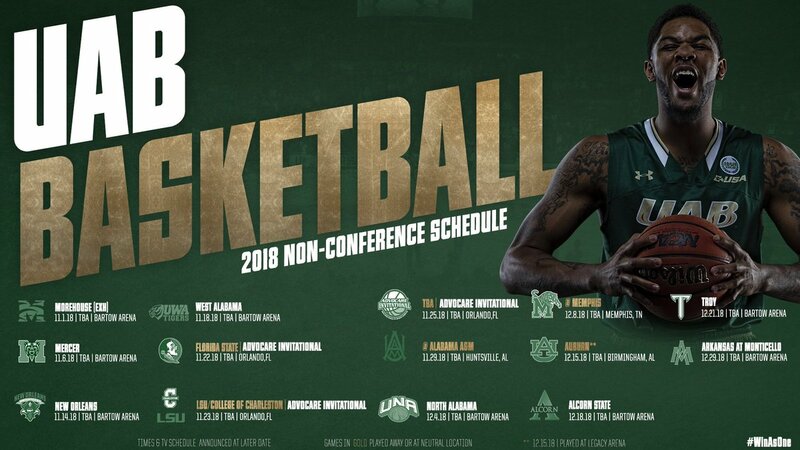 What record would it take for UAB to get an at-large bid with this schedule? 2) 4 loses puts UAB on bubble. (the TPA games and reaching tournament final determine fate). 3) 5 loses and UAB is NIT bound. So while I don't like the home schedule, maybe it has some built in advantages. I think all of C-USA is in this same boat. Win one or two high profile games in preseason. Then run the table at home and in the conference regular season if you want an at large bid. 3 losses bubble 4 out. We all know what we have to do until we get in a better league. The league is better than the pundits think and has deserved two for some time but let’s not kid ourselves. 4 losses you are on the NIT bubble. 5 out of that. (07-29-2018 03:58 PM)ATTALLABLAZE Wrote: 3 losses bubble 4 out. We all know what we have to do until we get in a better league. The league is better than the pundits think and has deserved two for some time but let’s not kid ourselves. No kidding. ESPN's BPI Top 100 just came out. Only CUSA teams listed are WKU at 66 and Marshall at 76. Both schools should be much higher. Any index that ESPN made up is basically worthless. No one uses it, besides talking heads to form their hypotheses. The %chance to win of their index is especially humorous. Home game for 5th year Senior, Lewis Sullivan.